This is one of my Portrait shots I used for Camera Club last night .. I took several Protrait shots at the recent Steampunk event that I attended and it was a bit tricky to choose which shot I would use .. This one I liked right from the start and it proved to be a good choice .. I got an Honours for it.. The judge liked everything about the shot .. repeditive circle .. his mask , the lapel braid and the clock .. and also the tones of the his clothes and background .. I was lucky he was standing under the platform verandah as the sun was pretty harsh that day .. Such a great image - and so deserving of an honours. Well done! Interesting outfit! 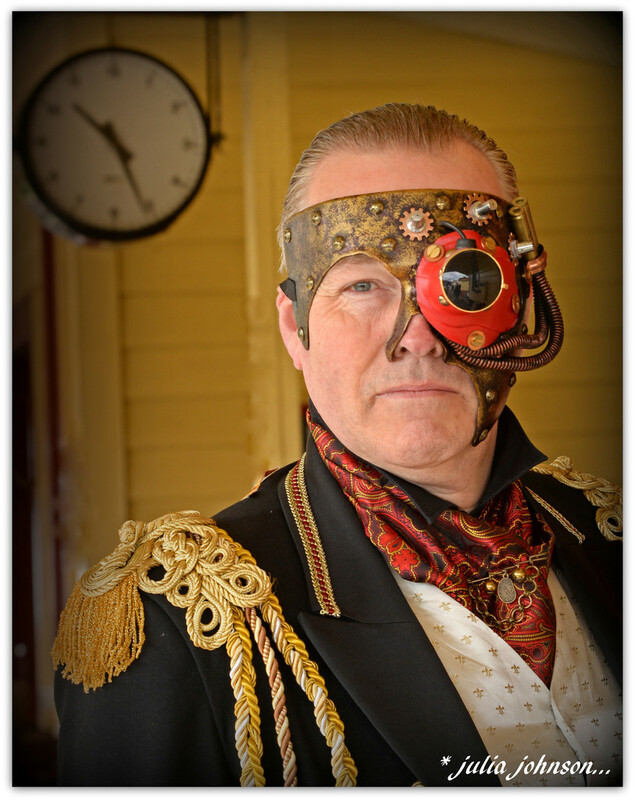 There is a steampunk weekend at Morecambe this weekend, which is only half an hours drive from us and had it in my diary to go as love the outfits. But now we are away so maybe next year?! Wow. What an outfit! What a shot. I love it and well done on your commendation! Congratulations on your success, it's a great shot!